ATTENTION: To all Donors, please send your Donations as GIFT MONEY through Paypal. Otherwise Paypal will take some of the money away as charges. MAKE PAYMENTS as GIFTS please, so all the money can be used properly. May Allah accept your donations, ameen. Please consider supporting this AMAZING PROJECT. It will be a sadaqa jariyah for you in shaa Allah. 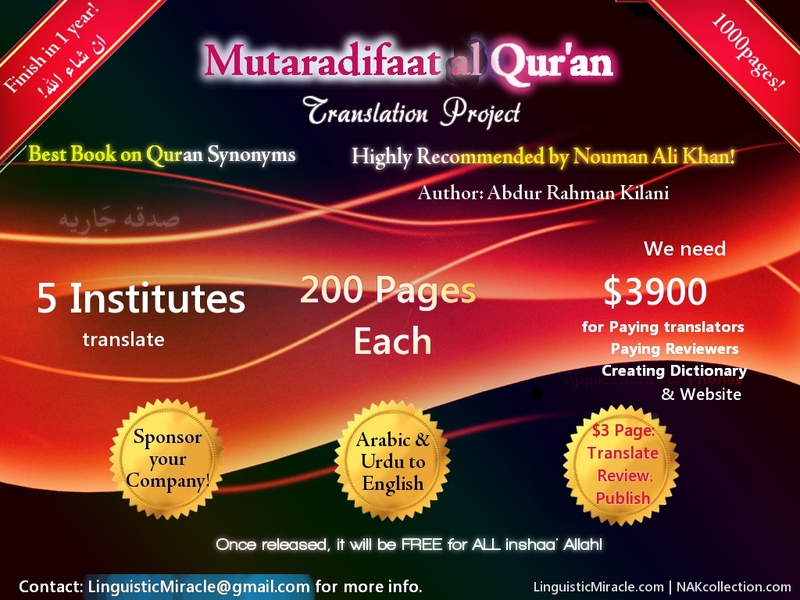 Our Aim is to translate one of the best Quran thesaurus - Mutaradifaaat al Qur'an - from the Urdu/Arabic language to English. It has been highly recommended by many teachers of Arabic and Qur'an including Ustadh Nouman Ali Khan of the Bayyinah Institute, Abdulazeez Abdulraheem, and others. We want to make it available in English so that more people can benefit. In order to achieve that we need committed and qualified Urdu - English translators. Past Attempts: We've tried translating parts of this book in the past, but with little success. (See http://Quran-Synonyms.blogspot.com). Most translators did not know both Urdu and English well enough. They couldn't help each other because they were in different parts of the world. This lack of communication and lack of commitment was what sadly made the project die out. Future Hopes: We know this amazing project has to continue. We know that the only way to keep it going is by having committed and qualified translators. We are thinking of contacting professional Quran and Arabic Institutes. We would ask them to divide the work amongst them because 1000 pages is a lot of work to translate. This is where you can come in to help out. Our audience: To execute the project, we need your donations. The money will be used to pay qualified, committed translators. We want to contact 5 famous Quran and Arabic institutes whose translators know Urdu, Arabic and English well. Our hope is to pay them $1 for every page translated, and another $1 for reviewing it. This will ensure that the work is kept up to high quality and it keeps the translators committed to the project too. The total cost for the translation part of the project is $2000. The extra $500 will be used for making a website to keep you updated and hopefully creating applications (for computers and cell Phones) so that you can also digitally access the Mutaradifaat al Qur'an Synonyms on an application. We might have to raise more funds in case translators or programmers require more money or time to finish the task. The earlier you donate, the quicker we can assign the projects to the different Quran and Arabic Institutes. You can even sponsor this project - your company or website will be advertised on the new website (the more you donate, the bigger the advert), and a du'a of your choice can be added to the project website so all the people who benefit from this from around the world in the near future will say Ameen to your du'a. Time Span: 1 year in shaa' Allah. It might take 2 years in case of delays due to the lack of money. If we start right away, we expect to finish by the end of 2013 or 2014 at most in shaa Allah. ATTENTION: To all Donors, please send your Donations as GIFT MONEY through Paypal. Otherwise, Paypal will take some of the money away as charges. MAKE PAYMENTS as GIFTS please, so all the money can be used properly.